A Diamond Select Release! Sculpted by Sam Greenwell! The X-Men series of Marvel Select figures continues! Cyclops, Colossus and company are now joined by Ororo 'Storm' Munroe in her original costume. 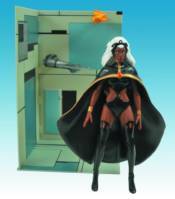 Standing 7 inches tall, Storm features multiple points of articulation, and comes with another section of the Danger Room featuring saw and torch pieces. Customers buying a case will get five regular figures and one figure with an alternate hairstyle. Storm comes in oversized collector packaging, and is only available on the specialty market!